In this Eon of the world, there will appear One Thousand Buddhas (enlightened beings) who will each successively attain complete and perfect enlightenment in Bodh Gaya (the holy city in India), and then each Buddha will teach the dharma to benefit others. Each time a Buddha appears in the world, the dharma is taught anew, for the teachings of the preceding Buddha have completely dwindled and disappeared. For countless eons, a great bodhisattva (a bodhisattva is a being who is striving to become a Buddha to benefit all) strived and perfected his mind towards the goal of attaining Buddhahood. This great bodhisattva was none other than the Buddha-to-be, Shakyamuni, who was born as the Prince Siddhartha in Lumbini in present day Nepal. Whether it was giving up his own flesh to feed a hungry lion or as an adored disciple of a master, this great being would some day benefit all as the Prince Siddhartha. Before reincarnating on earth in the Sixth Century B.C.E, this Bodhisattva resided in the Heaven of Tushita and then looked at the universe, surveying that the time was appropriate for him to reincarnate on earth and attain perfect Buddhahood in order to benefit beings. The Bodhisattva removed his crown and celestial ornaments, and enthroned the Bodhisattva Maitreya as his successor. Maitreya will reincarnate on earth as the Fifth Buddha of this eon once the teachings of Siddhartha no longer remain in the memory of mankind. After enthroning Maitreya, the Bodhisattva transformed himself into a white elephant which would enter the womb of the Queen Maya, in Nepal, and be conceived immaculately. This Bodhisattva, who was known to the world as Siddhartha, became the Fourth Buddha of this Eon to teach the dharma anew. Lord Buddha, the Sakyan Prince, had fulfilled the ten perfections since the life of Sumedha. Many ages ago, the future Buddha was named Sumedha, the only son of a rich man at Amaravati, a Royal City. He came from rich parental lineage, but his parents died when he was young. He deeply realized the sorrows of life. He gave away all his belongings in order to become an ascetic; after years of practice Sumedha gained supernormal powers. The local city prepared for the upcoming visit of the Buddha Dipankara by reconstructing the roads and buildings of the city. Sumedha laid his own body down on a unfinished part of the road for the Buddha to walk on as an act of devotion. The Buddha Dipankara, as he passed by the young man, declared that in the future, He will become a Buddha –just like me. As King Sivi, who was renowned for his charity, he offered his own eyes to an old blind Brahmin. As the King Vessantara, he offered an abundance of goods, clothing and silver to the poor. Since the people in his country objected to him offering a treasured white elephant, the King and his family left without any regret to live in the forest. As the Prince Alinasattu, his father passed by a cursed banyan tree and therefore had to be eaten by the tree’s ogre. The Prince went to the ogre. Through his skillful means, the Prince converted the ogre who thereafter practiced the five moral precepts diligently for the rest of his life. As the Prince Ayoghara, he endured the first sixteen years of his life in an iron cage. Afterward his father, the King, offered the Prince his entire Kingdom. Instead, the Prince realized the imminence of death and left royal life to become a religious man. As the Bodhisattva Mahosadha, he used his superior wisdom to block the evil plan of the King Culani Brahmadatta (who plotted to overthrow and kill all the other rulers of India). The Bodhisattva settled the dispute without any casualty. As the Bodhisattva Mahajanaka, he fled a ship which was about to face disaster from a storm by swimming for seven days across the ocean. As a monkey, he aided a selfish Brahmin (who was in the future to be Devadatta). When the Brahmin fell into a crevasse, the monkey brought him out to safety. However, the Brahmin tried to smash the monkey’s head in order to eat that evening. The monkey ran to the top of a tree, but still in order to show the Brahmin how to leave the forest, he swung from tree to tree. The Brahmin found his home by following the drops of blood shedding from the monkey’s head. As the King Mahasutasoma, he converted the evil King Porisada. The King Porisada was a cannibal. After being healed from a wound, Porisada ordered all the other Kings of India to offer themselves as a sacrifice to the spirit who supposedly healed him. One of those Kings, the Buddha appearing as Mahasutasoma, instead taught Porisada the dharma. Porisada released all his captives and practiced the dharma for the rest of his life. As the Prince Temiya, he gained the power to recall previous lives. He witnessed his past existences in hell. He pretended to be deaf and dumb, so his father ordered him to be executed in the forest. Therefore, the Prince would escape being involved in royal life. Once they reached the forest, the Prince explained why he acted stupid and became an ascetic for the rest of his life. As the sage Suvannasama, he cared for his blind parents and animals dearly. However, he was shot with a poisoned arrow. Due to the sage’s deep loving kindness, the poison turned untoxic and his parent’s regained their eye sight. As the Bodhisattva Lomahamsa he gave away all his belongings to become an ascetic. He did not become angry when people urinated, spitted or verbally abused him, nor did he show pride when people offered him food and flowers. His mind was not dualistic. Siddhartha Gautama, the Bodhisattva or Buddha-to-be, was born in the Sixth century BCE in Lumbini, to the north of the holy Indian city of Varanasi. His father Suddhodana was King of the Shakya clan, ruler of one of several kingdoms that existed in India and Nepal at the time. One night Mayadevi the Queen had an extraordinary dream in which a white elephant descended from heaven, walked around her three times and entered her womb. 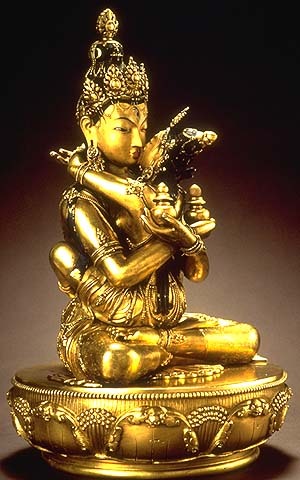 Thus, the Bodhisattva (or Buddha-to-be, Shakyamuni) was conceived immaculately. His mother, Mayadevi, was also conceived immaculately. As the time of the child’s birth drew near, and Queen Mayadevi was seized with a longing to return to her parent’s home at the foot of the Himalayas. Preparations were made for the journey and the Queen set out in a palanquin accompanied by her attendants. They passed by a beautiful garden at Lumbini where a grove of trees lay close by the road and one beautiful flowering tree captured the Queen’s attention. She alighted from her palanquin and went to admire the tree, which seemed to bend down towards her. Reaching out to clasp a branch of the tree it is said Siddhartha was born miraculously from her right side. He was born on the eight day of the fourth lunar month. The gods attended Siddhartha’s birth and witnessed the miracles which occurred. Emerging from his mother’s side, Siddhartha immediately took seven steps. At each step, a lotus grew out of the ground to receive the future Buddha, and the child stepped from blossom to blossom. The infant arose, pointing one finger to the heavens and one to the earth, declaring, xe2x80x9cIn the heavens and on the earth, I am the most venerable teacher of Gods and Men.” The child took birth to demonstrate to mankind that an ordinary man can rise to become the teacher of all living beings, a Buddha. The King and Queen summoned the wisest sages and the most learned men in the kingdom to interpret Siddhartha’s future. They were told that the Queen’s son would grow up to be exceptional: If he remained in the palace, they said, the child would be a great universal monarch ruling the entire world. If, however, their son was to renounce the world and abandon the comforts of the palace, he would gain enlightenment and find a path which would bring an end to the sorrows of mankind. Queen Mayadevi died soon after the birth. So, Siddhartha was brought up by his aunt. From early childhood, Siddhartha showed compassionate and meditative qualities. When a great sage by the name of Asita came to visit the Shakya court, he told the King that Siddhartha would not become a Universal Monarch, but instead a Buddha, an Enlightened One. The sage showed that the child was endowed with the thirty-two auspicious marks of spiritual awareness, such as a broad forehead, large eyes, thick eyelashes and so on, which indicated a life of spiritual achievement. The sage burst into tears because even though the child would become a Buddha, the sage Asita knew he would not live to see Siddhartha achieve Buddhahood. King Suddhodana was disturbed by this prophesy. He wanted his son to take a worldly path and to become a great King who would carry on the Shakya Dynasty. Suddhodana did everything in his power to direct Siddhartha’s energies towards worldly life. The Prince was surrounded by luxuries and diversions of every description. He was given instruction in all the pursuits that befitted his position by the best teachers of his time. The young Prince excelled in all that he undertook, and his days were filled with studying the scriptures, mastering arts such as archery and riding, listening to music, playing with his companions. One day the young child, Prince Siddhartha, went for a walk alone in a royal garden and was resting under a jambu tree. Almost without realizing it, he drew his legs into meditation posture, his mind became stilled and free of worldly thoughts; he was filled with peace and serenity. Some courtiers came upon Siddhartha as he sat in meditation. The courtiers noticed with awe that the shadows of all the other trees in the garden had moved with the passage of the sun, but the shadow of the jambu tree had remained where it was, in order to shade the Prince. Worried by this turn of events, the King’s advisors suggested that a wife and children would help to turn the Prince’s attention to worldly matters and so the search for a bride began. After considering all the eligible girls in the kingdom, Yashodhara, the daughter of a Shakya nobleman was selected. She was beautiful and well accomplished with great inner strength. According to the custom of the time, Prince Siddhartha had to compete for the hand of his chosen bride in a tournament of skill, and he thus showed his prowess in archery and wrestling, and in all the branches of intellectual knowledge. The wedding of Prince Siddhartha and Yashodhara was celebrated; the King was overjoyed. He felt that the Prince would now settle down and involve himself more completely in the affairs of the kingdom. He made sure the Prince was surrounded by beauty and graciousness, and protected him from anything that may cause distress. One day Siddhartha went out riding with his charioteer Chandaka. As he left the palace, he came upon an old man with bent body and legs trembling with the decrepitude of old age. Slowly, painfully and leaning heavily upon his stick, the old man was struggling down the road. Siddhartha never before seen the infirmity of old age. He pulled his chariot to a halt and asked his charioteer Chandaka what ailed the man. Chandaka replied that the man was old and his body was failing. In an anguished voice, Prince Siddhartha asked if all human beings were fated to grow old. Chandaka replied this was a fact of life. Siddhartha returned to the palace in a troubled state of mind. Shortly after this, the Prince went riding along another road that led southwards out of the city. He hadn’t gone far when he saw a man who was desperately ill. The sight shocked him and he stopped to ask Chandaka what the matter was. Chandaka replied that the man was mortally ill and no one could help him. Once again the Prince turned homewards in a troubled mood. Later, Siddhartha again left the city and saw a dead body being carried to the cremation ground. Behind the body walked a group of people wailing and crying. Siddhartha asked Chandaka why the procession of people was so sad. Chandaka replied that the man had died and his family would never see him again. Disturbed and anguished by what he had seen, the Prince again returned home. A short while later the Prince went riding along the road leading northwards. He saw a monk dressed in saffron robes. The monk carried a bowl in his hand and begged people for food and alms. The Prince asked Chandaka who the monk was and why he was dressed that way. Chandaka replied that the monk had renounced the world and all material possessions. These four happenings marked a turning point in Siddhartha’s life. The harshness of the sights he had seen brought about a realization that old age, sickness and death were the fate of all human beings. He began to understand the illusory nature of the existence he had led so far. The King heard of Siddhartha’s unrest and redoubled his efforts to keep him entertained and distracted. He strengthened the doors of the palace and set guards around the gates in an effort to prevent the Prince from leaving. Meanwhile Siddhartha had decided to leave the palace and take to a life of asceticism in an effort to find the truth, so he went to seek his father’s permission to do so. Due to the spell cast by worldly deities, King Suddhodana, in the grip of their spell, granted permission to his son. After Siddhartha had left his chamber, however, the King ordered his courtiers and soldiers to prevent the Prince from leaving the palace. That evening, Siddhartha’s wife gave birth to their son, Rahula. Siddhartha meanwhile sent for Chandaka and asked him to saddle Kanthaka, his horse. Worldly deities once again aided the Prince’s departure, causing the guards to fall asleep. The gates and doors opened of their own accord. Accompanied by Chandaka, Siddhartha rode out of the city and traveled far beyond his father’s kingdom. He dismounted from his horse and removed his Princely ornaments, giving them to Chandaka to be returned to his father. Then taking his sword he cut his long hair (a symbol of his princely status) and bade Chandaka farewell. Upon meeting a poor hunter he exchanged his fine silk robes for the man’s shabby saffron-colored clothing. He was no longer Prince Siddhartha, heir to the throne of the Shakyas, but Siddhartha, a wandering mendicant. His goal was to not only end the sorrows that himself, his wife, child and family were to one day face, but also to end the suffering of all mankind. Siddhartha traveled through the Gangetic plain in search of truth. He paused now and again to study with renowned teachers and in time came to the city of Vaishali. 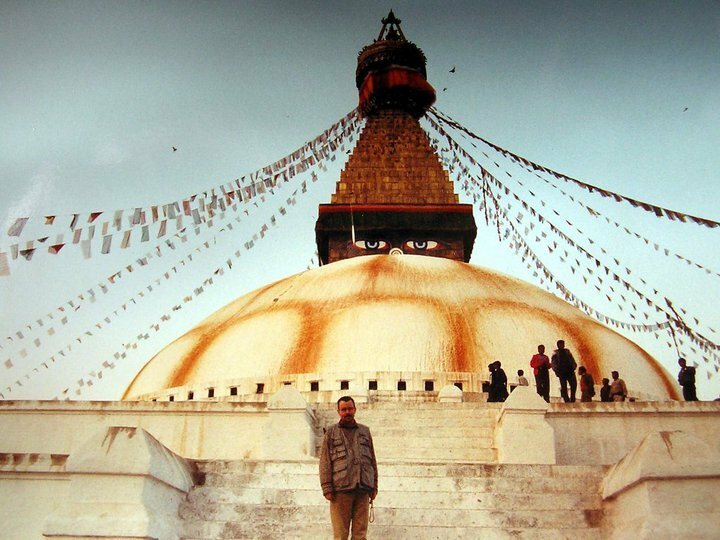 He had heard of a great teacher living there named Kalapa Arada who lived with 300 disciples in strict monastic discipline. Siddhartha listened and practiced the instructions of the sage but remained unsatisfied. He realized that Kalapa Arada’s path was not the one he wished to pursue and so he moved on. Soon afterwards he came to the city of Rajagriha in the state of Magadha. As he walked through the streets people were struck by his look of calm contemplation. Word reached Bimbisara, the King of Magadha, that a great monk had arrived in the city and so courtiers were sent to give alms to Siddhartha. The King’s men brought back the news that the monk was sitting in meditation at the foot of Pandava Parvataraja hill, so early the next morning King Bimbisara hastened to pay his respects to Siddhartha. He too was awed by the sense of great peace and serenity that seemed to emanate from the monk. After bowing to Siddhartha, Bimbisara begged him to make his home in Magadha, promising him land, a home and all the comforts that he desired. Siddhartha thanked the King but refused his offer, explaining that desire for worldly comforts was a poison. Desire, he explained, was the source of all the miseries of mankind and he had renounced worldly life to find an answer to mankind’s misery. Siddhartha then made his way to the home of Ramaputra, a famous sage who lived near Rajagriha with seven hundred disciples. Siddhartha joined them and devoted himself to learning all that the sage taught. He mastered the sage’s system of meditation and faithfully carried out all the wise man’s instructions. Five of Ramaputra’s disciples decided to go with Siddhartha to practice Ramaputra’s teachings of self-mortification They traveled to the area near Bodh Gaya. Here they lived for a time at Gayashirsha Hill and Siddhartha pondered deeply all that he had learned since leaving the palace. Siddhartha came to the banks of the Niranjana river near the village of Uruvela. The place was quiet and tranquil, so he decided to settle and undertake rigorous austerities. Here he meditated, stilling thought and bodily needs. Practicing the methods taught to him, he ate less and less, until his daily diet consisted of a single grain of rice. His body became thin and skeletal. Siddhartha meditated this way for six years He was disturbed neither by hunger nor by the scorching sun or torrential rains. He remained fixed in his purpose, his mind unswerving from the truth he sought. At the end of six years he realized that severe penance would not bring the enlightenment he sought, it would only diminish his physical and mental abilities. He broke his fast, drinking a little yogurt pudding offered to him by the girl Sujata who lived in the village of Uruvela. By the uptake of this food, his body instantly regained all its previous glory and splendor. Then he went to the Niranjana river to bathe. Siddhartha’s five peers abandoned him in disgust for giving up the austere practices. In the days that followed, Siddhartha returned to his former life as a wandering ascetic. He regained his health and strength. He was preparing himself for the final struggle to attain the supreme truth. Choosing the famous Bodhi tree close to the river, Siddhartha undertook to meditate until he attained the knowledge he sought. A local grasscutter offered him some soft green kusha grass for a cushion. Siddhartha walked around the tree seven times and then he prepared his seat. Sitting down facing eastwards, he began to meditate, vowing that he would not get up from that spot until he had attained enlightenment. As Siddhartha sat deep in meditation, Mara (the Lord of Delusion who personifies the obscurations of our own mind) was unable to bear the sight of Siddhartha’s inevitable realization of ultimate truth. Mara came with his army to distract Siddhartha from his contemplation. They came in the form of beautiful maidens, and then in the form of fearful demons. They tried to break Siddhartha’s concentration through temptations and then through fear. The arrows sent by the demons only turned into flowers, and the torrential storms merely dispearsed. The Buddha-to-be remained impervious to the illusions and spells with which Mara tried to undermine his efforts. Mara then taunted Siddhartha, claiming that Siddhartha had not produced any good merit in the past. Siddhartha stretched down his hand and touched the earth, calling it to bear witness to his eons of striving for virtuous ends. The earth quaked in all directions and miraculously testified that over countless lifetimes Siddhartha had practiced the perfections of generosity, discipline, patience, effort, concentration and wisdom. Mara and his army fled at the sight of defeat, each demon fleeing in a different direction. During that night, Siddhartha entered into deeper and deeper states of meditative absorption. He realized the interdependence of all phenomena and directly perceived that nowhere was there even one atom that had even the slightest independent existence. He saw that every instant of suffering stemmed from the inability to understand the way in which all things exist. The very subtle layers of obscuration that veiled the pure clear light nature of Siddhartha’s mind were removed and at dawn he arose as a fully awakened one, a Buddha. He had conquered sorrow and attained supreme bliss. Sitting under that pipal tree Siddhartha had finally accomplished his goal by demonstrating to the world the path and attainment of Buddhahood. In this way, the Buddha was born in order to show that an ordinary man can become a Buddha. (1) The Buddha remained seated on the throne under the Bodhi Tree. (2) After rising from the throne, the Buddha went a few paces to the north-east of the throne and stood there gazing back at the golden throne and the Bodhi Tree without closing his eyes. (3) Next, he walked up and down a jeweled path which extended east to west between the Bodhi Tree and the place where he had formerly stood. (4) After that the Buddha went to the jeweled chamber, known as Ratanagara, the north-west of the Bodhi Tree where he contemplated the Abhidharma, the teachings on the workings of the mind. When he finished, six colored rays brilliantly emanated from every part of his sacred body and spread through the whole universe. (5) The Buddha then went to the Ajapala banyan tree, east of the Bodhi Tree at the bank of the Niranjana River where goat herders rested. There, he engaged in meditation and Mara’s daughters tried to entice him but then left since they failed again. (6) The Buddha went to the foot of a tree and entered meditation as great showers of rain fell for seven successive days and thus the weather was very cold. The Serpent King, Mucalinda of the nearby lake, sheltered the Buddha by winding his body seven times around the Buddha’s body and holding his head over the Buddha. (7) The Buddha sat under the Rajayatana tree and meditated there for seven days. The very first teaching of the Buddha was esoteric, and hidden away by the Nagas (serpent spirits). These teachings were not deliver by the Buddha himself, but by the bodhisattvas and other beings who spoke of the Buddha’s qualities and activities after his achievement of enlightenment. These teachings became known as the Avatamsaka Sutra. Finally, the Buddha left the Bodh Gaya area and traveled to the deer park at Sarnath, where his five former peers were living. On the way he passed two merchants, Trapusha and Bhallika. Seeing the Enlightened One’s glowing countenance, the two merchants bowed before him and offered him the choicest food they had. The merchants went on their way, greatly uplifted by the encounter. The Buddha, at first, decided to not teach the Dharma because others would not understand its meaning. Like is traditional, the Buddha had to be requested to teach the Dharma. The gods Indra and Brahma, presenting a conch shell and golden wheel as offerings, did so accordingly. Traveling northward, along the river Ganga, the Buddha reached the city of Varanasi and went directly to the deer park at Sarnath to find his five peers. They had previously left the Buddha on the banks of the Niranjana river, after becoming disillusioned with him for forsaking the practice of austerities. When they saw the Buddha now, at first they tried to shun him. However, they soon were overwhelmed by Siddhartha’s serenity and tranquillity. The five peers became the Buddhaxe2x80x99s disciples. They washed Siddhartha’s feet and invited him to sit, requesting the Buddha to teach. The teaching at Sarnath was the Buddha’s first turning of the ‘Wheel of Dharma’. He taught the Four Noble Truths, which have remained the basis of all traditions of Buddhist doctrine to this day. The Buddha talked all through the night and when morning came, the five disciples embraced his teachings and took refuge in the Three Jewels of Buddhism; the Buddha, the Dharma and the Sangha. They became the first five members of the Sangha, the community of monks who follow the teachings of the Buddha. The next individual who accepted the Buddha’s path was a young nobleman named Yasa. Like the Buddha himself, Yasa had been born into an affluent family and surrounded by luxury, yet he left his home and family in search of the truth. Yasa’s father, coming in search of his son also listened to the Buddha and was so struck by the teachings that he and his household also converted to the Buddha’s path. Yasa and his father became the first of many lay followers who accepted the teachings, but did not give up their worldly lives to become monks. Many more young monks joined the Sangha and were taught by the Buddha. When they had understood the teachings, they would go out in different directions, to spread the Dharma for the welfare of all living beings, just as the Buddha himself was doing. The Buddha traveled back to Uruvela, near Gaya, where he gathered other one thousand followers who converted only after the Buddha performed numerous miracles. The Buddha returned to the King Bimbisara, welcomed by a great ceremony and the King became a lay disciple. In the King’s country, over one hundred thousand people entered the path of realization and over ten thousand took refuge. The King offered the Buddha and his followers a bamboo grove and monastery in which to live. Thus the Buddha and his followers traveled through the Gangetic plain, but returned to the grove only during the monsoon rainy seasons. For the next forty years, the Buddha and his disciples traveled from one village and town to another and spread their message. Buddha also returned to his home of Kapilavastu, where his father, King Suddhodana, greeted him with jubilation and invited him to teach. Hearing the Buddha’s teaching, the King along with Yasodhara and Rahula (the Buddha’s son) also embraced the Dharma. Rahula became a monk and disciple of his father. The Buddha’s son, wife, father and aunt all attained realization. The Buddha’s travels took him to Vaishali, Sravasti, Rajagriha and Kushinagar. Wherever the Buddha went, he gave teachings that would most benefit the listener. The Sangha grew and flourished in the villages of the Gangetic basin, and word of the Buddha’s teachings spread far beyond. Scriptures recount many miracles and great works performed by the Buddha who at one point created a thousand Buddha images in the sky depicting the postures of meditation and teaching. In this way his critics were silenced and all doubts set aside. The Buddha also visited the realm in which his deceased mother was born into (the heaven of the Thirty three Gods), bestowing on her various teachings. Generally, the Buddha’s teachings to the public were based upon the Hinayana, the teachings which lead one to the end of suffering and Arhatship. During the later part of Buddha’s life, he began to teach the Mahayana, or the vehicle which leads to Buddhahood. This vehicle explained the path in which the Bodhisattvas (and the Buddha himself undertook) travel to achieve enlightenment. The Buddha also taught the tantras which are the teachings of the Vajrayana. The Buddha gave four tantras: the kriya tantras, the carya tantras, the yoga tantras, and the anuttarayoga tantras. These teachings were given in many places. Sometimes the Buddha gave these teachings in some of the god realms such as Tushita and some of the teachings were given in physical places in India. Those receiving these teachings were bodhisattvas and dakas and dakinis practicing the secret mantas. King Indrabodhi and others received special transmissions of the Buddhist tantras. The sutras already provided very deep and vast teachings on the nature of phenomena. But with the vajrayana, the Buddha was able to give people the possibility to achieve the fruition of the Buddhist path very quickly and without major hardships. 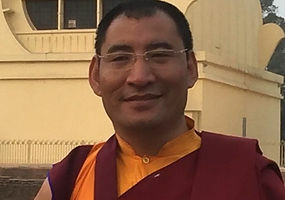 The vajrayana can do this by providing special skillful means such as the meditation on the generation stage and the completion stage of a deity, and using meditation techniques of looking at the nature of the mind directly. At the request of his cousin Ananda and his Aunt Gotami, the Buddha allowed the establishment of an order of nuns. However, the Buddha warned that nuns would be targeted due to their gender and that the nuns could experience more difficult obstacles than the monks, especially due to unfair biases. During his Aunt’s passing away, the Buddha urged her to disprove the misunderstanding that women cannot attain Arhatship. So, Gotami performed numerous miracles after she died which stunned those present. Devadatta was a cousin of the Buddha who ended up holding a grudge, because the Buddha refused to let Devadatta become the head of the Sangha. Although Devadatta, with the help of King Ajatasatthu, repeatedly tried to kill the Buddha, he did not succeed. As a final assault he made a wild elephant drunk so that it might trample the Buddha to death. Instead, the Buddha, through his great loving power, stopped and taught the elephant. Devadatta attempted to throw a huge boulder to crush the Buddha on a hill, the Buddha just stood still as the boulder hit a sharp rock and split into pieces, each rolling by the Buddha on the side but missing Him. However, a small pebble hit the Buddha’s toe and caused the Buddha to bleed. Devadatta commited one of the most evil acts by harming a saintly being, and later on felt remorseful. Khema, one of King Bimbisara’s queens, disliked the Buddha because he did not acknowledge her beauty. One day she was drawn to the place where the Buddha was teaching just by his voice alone. But she sat in the very back of the gathering, covering her face. The Buddha, through his omniscient wisdom, knew she was present and conjured a young girl who was even more beautiful than Khema. However, the girl soon grew old, died and rotted right in front of the Queen’s eyes. The Queen realized impermanence and joined the order of nuns. Anathapindika, a very rich man, had such great devotion for the Buddha that upon their first meeting his body glowed. He bought a park for the Buddha and built the Jetavana Monastery for the Buddha. This was where the Buddha resided during the rainy reason. The park’s cost was measured by the amount of gold coins it took to entirely cover the ground without any earth showing. A man named Kasibharadvaja snickered at the Buddha because the Buddha received alms from others and did not grow the food himself. The Buddha explained that although he does not plough, weed and plant seeds of earth, he does plant the seeds of faith and weeds with truthfulness. The man realized his error, bowed to the Buddha and later on became a monk attaining Arhatship. The King Kosala lamented to the Buddha that he had a daughter instead of a son. The Buddha told him to not grieve, because a daughter can be very wise and virtuous, and possibly even more honorable than a male child. A band of wicked ascetics once attempted to frame the Buddha and his monks for murdering a female sage, Sundari. They told her to spy on the Buddha near the Jeta Monastery, and killed her, burying her there and then reported to the King Kosala that she was missing. After some searching for the wicked men she was buried and killed. The local people began shouting and accused the Buddha and his disciples. But since they were innocent and remained calm, the local people realized that the Buddhist truly could not be the murderers. The Buddha advised his disciples to remain with a pure mind in face of harsh words. The ascetics were found to be the real murders and the Buddha became even more honored. The savage Angulimala was converted by the Buddha. Angulimala was once a wise pupil of a renowned teacher. But when Angulimala refused the wife’s invitation to consort with her, she told her husband to punish Angulimala for trying to assault her. Out of revenge, the teacher taught Angulimala that in order to achieve perfection he must kill one thousand people and make a rosary out of their fingers. The young man became a savage, blindly following his teacher’s words. When he saw the Buddha approach, he figured that his final victim had arrived. However, the Buddha ended up converting the man and taught him virtue. One time, a female was set up and hired by a band of jealous sages to accuse the Buddha of impregnating her. However, the deva Indra transformed himself into a rat and pulled the pot from underneath her cloths, revealing that she was a liar. When the Buddha was eighty years of age, he announced that his time was at an end. He prepared his followers for his Parinirvana, the great cessation of his existence on earth. The Buddha’s main attendant was his disciple Ananda. The Buddha told Ananda that after his death the Sangha should not think their Master’s words had come to an end. The truth of the Dharma and the Sangha would continue to guide and teach those who came after he had died. When he and his followers had reached Kushinagar, the Buddha ate a meal which was offered. The meal consisted of soured food which brought on a deadly illness. “Decay is inherent in all compounded phenomena! When the ruler of Kushinagar heard of the Buddha’s death, he sent word that he would arrange the funeral ceremony. The last rites were carried out with all the honor due to a Universal Monarch. The Kings of all the states of the Gangetic plain were in attendance. After the cremation they divided the Buddha’s ashes into eight parts and each King carried these back to his kingdom, where a Stupa was built out of respect and veneration. The Buddha Shakyamuni, born Prince Siddhartha Gautama, was a human being who was able to go beyond the mere capabilities of materialism and nihilism. Instead, he transcended suffering and decided to benefit all. Today, his blessings still remain with us. Even though the Buddha’s physical body died,his mind still pervades all existence and he can still manifest to benefit living beings.